Quick overview Tells the story of how architecture became obsessed with the flashy, the monumental and the ostentatious - and how we all have to live with the consequences. This book explores cityscapes from New York to Beijing, and from Bilbao to Portsmouth, the author shows that we are not just witnessing a new kind of building. In Dubai, a luxury apartment block is built in the shape of a giant iPod. In China, President Xi Jinping denounces the trend of constructing "Bizarre" new buildings in wacky shapes and colours. In Cincinnati, celebrity architect Zaha Hadid is paid millions to design a single "Iconic" structure - with the hope of single-handedly transforming the region's ailing fortunes. These incidents are all part of the same story: the rise of the age of spectacle. Over the last fifty years, there has been a revolution in how our cities operate. In The Age of Spectacle, Tom Dyckhoff tells the story of how architecture became obsessed with the flashy, the monumental and the ostentatious - and how we all have to live with the consequences. Exploring cityscapes from New York to Beijing, and from Bilbao to Portsmouth, Dyckhoff shows that we are not just witnessing a new kind of building: we are living through a fundamental transformation in how our urban spaces work. The corporate explosion of the last few decades has fundamentally shifted the relationship between architects, politicians and cities' inhabitants, fostering innovative new kinds of engineering and design, but also facilitating ill-conceived vanity projects and commercial power-grabs. 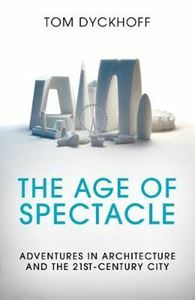 Timely, passionate and bursting with new ideas, The Age of Spectacle is both an examination of how twenty-first century cities work, and a manifesto for a radically new kind of urbanism. Our cities, Dyckhoff shows, can thrive in the age of spectacle - but only if they engage us not just with dazzling structures, but by responding to the needs of the people who inhabit them. "First class. Finally, a book that nails the iconic movement - Tom Dyckhoff's The Age of Spectacle is the book that I wish I had written." (Simon Jenkins).